Clearwater, FL., November 15, 2014 – A Fall Classic championship game without the Atlanta Bulls is a rare occurrence. So, with the Bulls back in the title game following a one-year hiatus, Dytarious Edwards and Thomas Lee Rodney weren’t about to allow the opportunity slip away. With Edwards’ team-MVP performance leading the way, the Braves used a bit of small ball to take an early lead, then showed they can also slug their way to runs by scoring four times in the fifth to blow it open. Leading 1-0 in the fourth, a pair of errors put runners on the corners with one out, before a balk allowed Chris Yates to double the advantage. An inning later, Yates forced across a third run thanks to a two-out, full-count walk. One batter later, Edwards blasted a double into deep right center to clear the bases and push the advantage to 6-0. It was more than enough for Rodney. Changing speeds throughout, Rodney kept Giants batters off balance all game. 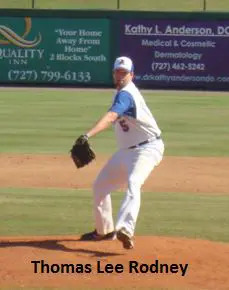 He rarely faced trouble in tossing his second complete-game shutout against D.W. Energy Group after blanking it 2-0 in the 2012 semifinals. “As a starter, you always know you have to pace yourself,” Rodney said afterward. “I wanted to pick my spots to put a little something extra on a pitch. The loss was the third in four games for the Giants against Atlanta, having also lost 8-2 during a 3-2 round robin play. D.W. Energy Group reached the title game via a thrilling 11-8 playoff victory over the E.C. Cardinals in which Travis Hitzeman and Franklin German each had three hits. The Giants trailed 5-0 in the first before scoring four eighth-inning runs to take a 9-8 lead. The Bulls, whose semifinal defeat last year was the only time since 2005 that they failed to reach the title game, finished round-robin play 4-1, before knocking off the Santa Fe Titans 5-2 in the playoffs. Stephen Hueston pitched 7-1/3 strong innings to earn the victory.